There are now three extra questions involving identification checks. These will appear on all medical questionnaires for pain relief products. Not submitting to these checks will mean that we cannot process your order. . You must agrees to these for us to process your order. Like other combination pain relief treatments, this medicine is most typically used in cases where single or weaker treatments may not succeed in alleviating pain. 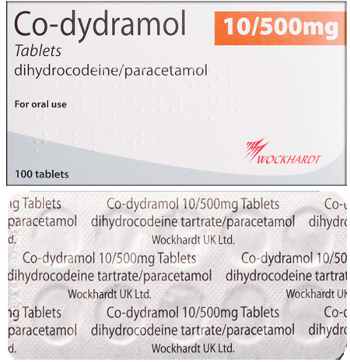 Co-Dydramol is generally used to provide relief from moderate pain. This type of pain might be related to an injury or a surgical procedure. The acting agents in this treatment are dihydrocodeine tartate and paracetamol. Dihydrocodeine is an opioid analgesic that works by mimicking the action of endorphins and helping the brain to ignore pain signals. Paracetamol goes to work on the nerves surrounding the affected area itself, helping to lessen their perception of pain. Because it contains an opioid agent, you can buy Co-Dydramol online in the UK only after prior consultation with a doctor. This is so they can assess your condition and determine whether you are at an increased risk of experiencing harmful side effects. Those who are allergic to any ingredients should never use this treatment, and a doctor may refuse to issue it to persons suffering from certain conditions. Possible side effects include addiction, liver or kidney dysfunction, and heart problems. For a fuller account of restrictions and side effects, consult the safety information leaflet provided. The pharmacy we use will always put your safety and privacy first. They will only ever send your order in plain and sealed, unmarked packaging. Orders which reach them before 3pm on a weekday are shipped on the same day, by next day tracked courier. At all other times, your order will be shipped at the next available opportunity. To buy painkillers online, you must first undergo a medical consultation. This is to ensure that the product you are ordering is safe for you to use. At Pain Relievers UK, we strive to make the ordering and consultation service as easy as possible. Once you have ordered your medicine, you will be taken to our online consultation facility, where you will be asked to fill out a health questionnaire. A doctor registered in the UK will review your answers and generate an electronic prescription if they are satisfied that the medicine is suitable for you. This prescription will then be sent directly to our GPhC-registered dispensing pharmacy.